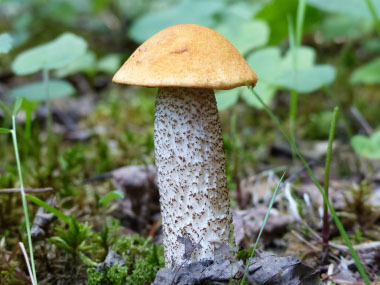 Overview: This common bolete can be easily found in forests in which there are mostly deciduous trees, especially birches. Dark-stalked boletes are not a commonly sought-after edible fungi due to the lack of taste or scent. They can be found scattered or solitary. 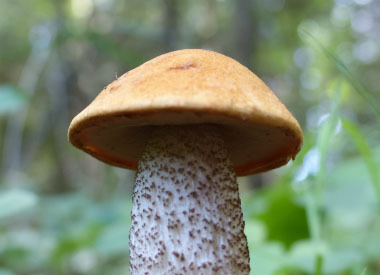 Distinguishing Features: The caps of dark-stalked boletes can measure anywhere between 7 and 20 cm (3 - 8”) across, are convex, dry, yellow-orange in colour, and hairy to fibril-streaked. The flesh is white, staining grey then black. The flesh discolours when cut, bruised or damaged. Stalks can get to about 3.5 cm (1.5”) in width, firm, are white with many raised black markings called scabers. These scabers are black when young and at maturity, blue or blue-green stains occasionally appear on lower part of the stalk. Height: 10 – 20 cm (4 – 8”). Habitat: Dark-stalked boletes are generally found in mixed woods near deciduous trees across North America, Europe, and Asia. There is a mycorrhizal association with poplar, birch, and oak. Spore print: Spores are brown,spindle-shaped ellipsoids, and smooth. Season: Approximately July into early autumn. 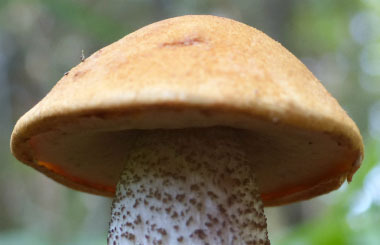 Gills: Boletes have pores. 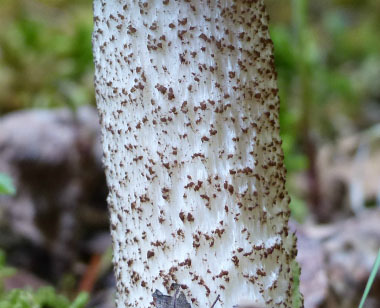 These pores are small, round, smoky to blackish-brown. Edibility: Always pick healthy-looking specimens and cook before consuming. Bake in oven or fry dry – added oils or butter will make these mushy. Do not eat in large quantities or frequently. 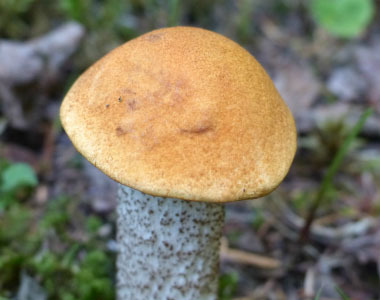 This bolete does not have a distinctive taste nor scent.